Glaucoma is a leading cause of blindness in the United States. It causes damage to the optic nerve due to high pressure in the eye. MicroAcupuncture can help patients by repairing the damage to the retina caused by the increase in intraocular pressure. This increase in pressure causes the small capillaries in the eye to collapse, resulting in damage to areas of the retina. In rare cases it can help to keep the pressure down, but in most cases it has no effect on the pressure. The eye is constantly producing a clear fluid called aqueous humor. An equal amount of fluid is constantly filtered from the eye. The pressure in the eye is a balance between the amount of fluid produced, and the amount of fluid filtered. If either too much is produced, or not enough is filtered, the pressure in the eye becomes high. When this happens, the optic nerve at the back of the eye is damaged. The damage initially causes small blind spots in the field of vision. In more advanced cases, damage to the nerve leads to loss of peripheral vision, and in extreme cases, loss of central vision too. 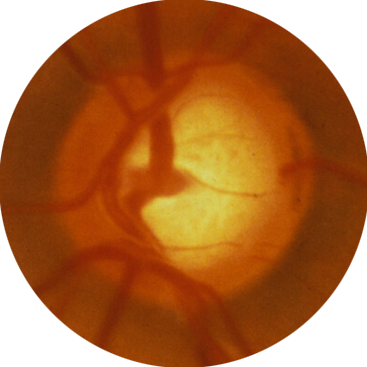 There are no symptoms of glaucoma in the early stages of the disease. The only way to know if your eye pressure is elevated is to have an intraocular pressure check. The only way to know if small, isolated blind spots are present in your field of vision is to have a visual field test. If either of these problems are detected during your eye exam, the pressure can be controlled by medication, laser, or rarely by surgery. Early control of pressure can avoid any damage to the optic nerve and vision. When you suffer from glaucoma, there are some things you as a glaucoma patient can do yourself to slow down the progression of the disease. When you combine positive lifestyle changes and provide your body with necessary vitamins and minerals, you will "see" the difference. 4. Make it a habit to exercise at least 30 minutes every day, drink at least 64 ounces of water a day, and try to be lean with the salt throughout your meals. Glaucoma starts with plaque buildup in the arteries, so protect your eyes the same way you would protect your heart. 5. To monitor the development of glaucoma, you can get vision field scans, this will map the area and severity of the damage you have. You can have an amsler grid test to check for changes within the eye. You can also have a near visual acuity card test to check your vision in reading distance (18”) on a regular basis. You still have to keep up with your regular appointments with your ophthalmologist. For more detailed information about the nutrition for Glaucoma, see our Glaucoma Nutrition Page. Result from treating Glaucoma with Micro Acupuncture.